The only number you need For a Poop-free lawn! 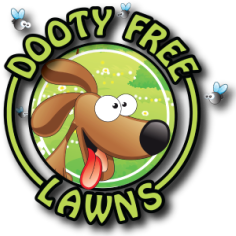 Why Hire Dooty Free Lawns? Hire us - we are Professional Poop Scoopers. All tools and footwear are disinfected between each yard visit to eliminate the spread of disease. We work with any size property, be it a home, apartment, condominium, acreage, patio, or deck. We also clean up larger areas such as community lawn areas at commercial properties. Work is individually and competitively priced by the job before we start - no hourly rates and no surprises. Bottom line, the POOP SCOOPING has to get done and we want to help you. Left to accumulate, dog waste ruins the appearance of your property, attracts disease carrying pests and offends the neighbors - not to mention endangering the health of your pets and your family. Let us do the dirty work!